Ramallah - the fairest of them all? The fairest of them all? A reflection on the social history and contemporaneity of Ramallah. Ramallah - the fairest of them all? is the title of the second exhibition in a series launched by The Ethnographic and Art Museum of Birzeit University with the theme Palestinian Cities. These exhibitions attempt to draw attention to a variety of relationships between people, place, and time, keeping the cadence and uniqueness of each city. The project proposes to look beyond the stereotypical representations of nostalgia and folklore, juxtaposing past and contemporary visual and cultural evidence, not only to affirm the uniqueness of these cities, but also to challenge the issues of memory, identity and change. The first exhibition last year, "Jerusalem is our home", was part of the events of Jerusalem as the Capital of Arab Culture. The main curatorial idea of Ramallah - the fairest of them all? comes from the fairy tale Snow White and the infamous persistence of the wicked queen in asking her mirror, "Mirror, mirror on the wall, who’s the fairest of them all?" Asking about her contested fairness unravels threads of insecurities; it’s the dark side of her reign and her fight for the title as the fairest of them all. The "mirror" is a medium in which one is critical and aware of one’s own reflection and existence. Therefore, the exhibition is a self-reflection on the social history and contemporaneity of Ramallah, where art becomes a critical means of inquiry into the making of the city, its spaces, events, hopes and anticipations. Ramallah in the Past is featured in an exhibition at The Ethnographic and Art Museum at Birzeit University, while Ramallah Today is a series of public interventions camouflaged within the urban fabric of the city and its historic center. The show at The Ethnographic and Art Museum tackles issues of collective and individual memory and change and is presented through installations, groups of photographic images, videos, and displays of personal or public objects. It mirrors issues of roots and authenticity, touching on the meanings of belonging, ownership, loss, and estrangement. It’s a tale of Ramallah as it was in the 40’s and 50’s of the last century, a small town rooted in the history of its family clans and origins. Relived in this exhibition as if through the mirror of the past, Ramallah is remembered as a charming place, with personal stories of love, immigration, marriage, myths, heroes, and anti-heroes. It’s a story that narrates life modes, ceremonies, and rituals of the private, sometimes mundane reality of everyday life. A cry of loss? Perhaps, yet this exhibition is an invitation for recovery and reflection not only of the Ramallah that was, but also of what it ought to be. The exhibit also accommodates the work of two artists, Vera Tamari and Rajie Cook. Both artists embark on unraveling an alternative social history of Ramallah. In his piece Pastports, Rajie Cook narrates the tale of the poignant hardships of immigration and estrangement in a documentary about his father’s first journey from Ramallah to America in 1906. Vera Tamari, titling her work Terra Fidea - Land of Fidelity, adapts sections from Yasmin Zahran’s book, Al Lahn al Awwal (First Melody) in an installation of painted tableaux and readings, with the voice of Tania Tamari Nasir. Al Lahn al Awwal is a love novella centered on the platonic relationship between Raya and Musa. The backdrop is a neighborhood of old Ramallah and the misty valley with the surrounding terraced hills. Ramallah Today is represented by five artists and three interventions in the city's public spaces. They create a mirror through which Ramallah’s contemporary image is reconstructed. The city itself becomes an exhibition where people stare back in curiosity at the different art forms from billboards and posters to sounds, reflecting on local spatial issues of modernity, architecture, politics, society, identity, and change. Emily Jacir and Yazid Anani present Al Riyadh, a series of public interventions that explore the rapid transformation of the urban fabric of Ramallah. The work questions the correlation of the decline of the Palestinian collective political project and its resistance to colonialism with the emergence of a city entrapped by neoliberal politics, neo-capitalist structures, and complete isolation from the Palestinian community. 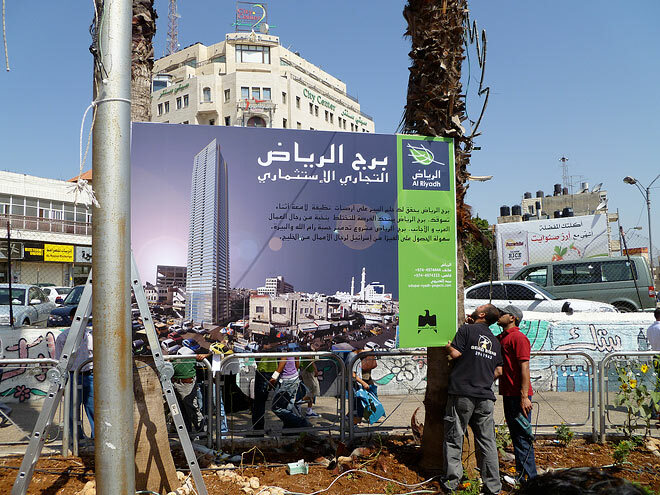 Two billboards in the heart of Ramallah propose two fictional projects to the public. Al-Riyadh Tower is a proposition to destroy the old vegetable market and replace it with a modern Dubai style tower, promoting a clean business environment and spaces for foreign trade exchange while, replacing the intimacy, heritage, and memory of the place. The other billboard promotes a gated community emulating the proliferation of housing projects around Ramallah, with walled perimeters, surveillance cameras, and private security personnel; projects that threaten to wipe out the historic center of Ramallah and replace its architectural heritage with a housing project that looks similar to that of Israeli settlements. Ramallah Syndrome is a public intervention by Sandi Hilal, Alessandro Petti, and Yazid Anani. It follows up on the work presented by the artists at the 53rd Venice Biennale. In this edition, the artists distributed thirty questions printed on canvas to various coffee shops and restaurants all around the city. The work questions the normality and normalization of life in Ramallah with provocative questions: How to distinguish between having a normal life in Ramallah and normalizing the occupation? Where are Ramallah’s borders? Is Ramallah liberal? Is Ramallah the capital? Is Ramallah under occupation? Is Ramallah New York? Inass Yassin’s Projection is a public intervention originated as part of a body of works that examine modernity and the transformation of urban space and the architecture of the city of Ramallah. The work researches Cinema Al-Waleed and its multilayered social history, exploring the past through narratives and visual icons from posters, ornamentations, architecture, projection machines, and other objects. Projection critically stages the schism between the glorious history of Al-Waleed Cinema and the temporality and distortion of a live projection within its present demolished architecture. Vera Tamari: Artist, art historian and educator. Founder and director of the Ethnographic and Art Museum, Birzeit University, Palestine. Yazid Anani: Assistant professor at the Department of Architecture, Birzeit University, and head of the academic council of the International Academy of Art Palestine.